ConjureMan Ali is a professional conjure doctor and reader, is a member of the prestigious Association of Independent Readers and Rootworkers, and co-hosts the reknown Lucky Mojo Hoodoo Rootwork Hour. Dr E. is a rootworker, two-headed conjure man, psychic reader, medium and spiritual consultant. 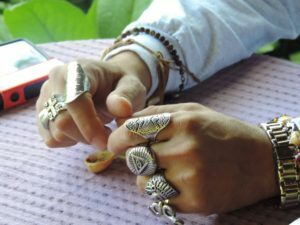 He is also a member of the prestigious Association of Independent Readers and Rootworkers, and appears regularly on The Lucky Mojo Hoodoo Rootwork Hour. As time allows we will be taking your calls for readings with ConjureMan Ali, Dr. E., and Tata Candelo.